Y’all!!! I’m finally (almost two years after moving) getting around to unboxing all of my old manuscripts and notebooks, which have been sitting in my office closet all this time. There are lots and lots of notebooks. 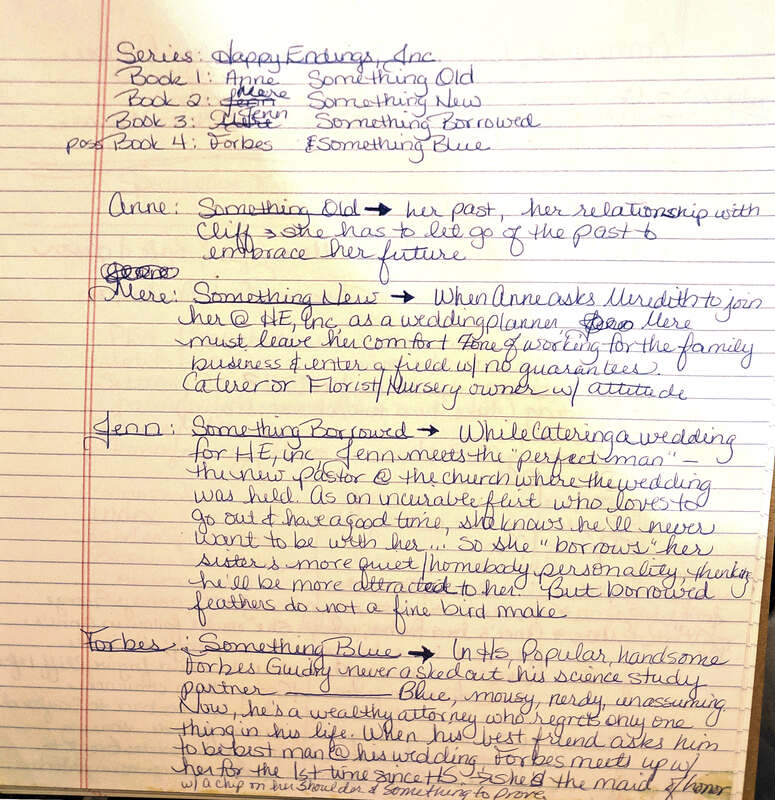 In flipping through these notebooks to see which ones still have usable space in them (20+ blank pages), I found something amazing—the original series idea for what became the Brides of Bonneterre series!!! I probably wrote this for a grad school assignment, as there are course/workshop notes in the same notebook, so that means it was written some time between June 2004 and June 2006. And I have no memory of writing this! Definitely keeping this notebook out to serve as inspiration/motivation for getting Jenn’s book written this year! And this, in turn, gave me an idea for my theme for February. Since one of my writing professional development master plans for this year is to re-read as much of my old writing as I can, I thought I’d share some snippets and samples of ideas that never made it past that stage or scenes that got cut from the published stories. If you’re a writer, do you go back and re-read your old, never-see-the-light-of-day-again writing? As a reader, what author(s) would you love to see share their unpublished work? Now it’s time to get into the nitty-gritty of what my planner is designed for—planning out my weeks so that I can be productive daily. In this YouTube video, I walk through setting up my weekly planning spreads (the script I worked from is pasted below the video). Hi, all! Welcome back to the channel! Today, I’m going to show you how I set up my weekly planning spreads! A few people have asked me how I set up the computer files, so here’s a quick, sped-up look at the layout and design process. I didn’t show it from the beginning, where I set up all of the tables and modules in Publisher and Excel, because that would have taken hours, even on four-times speed like this is. But this should at least give you an idea of what I do when I’m designing my planner. As I mentioned in a previous video, once I found the snowflake border that I really liked, I went ahead and added it to all January pages because I like consistency and continuity. And, as also mentioned, it drove the color scheme for January. But since this week includes days for next month, I decided to go ahead and introduce the banner art and color for February on those days as well. 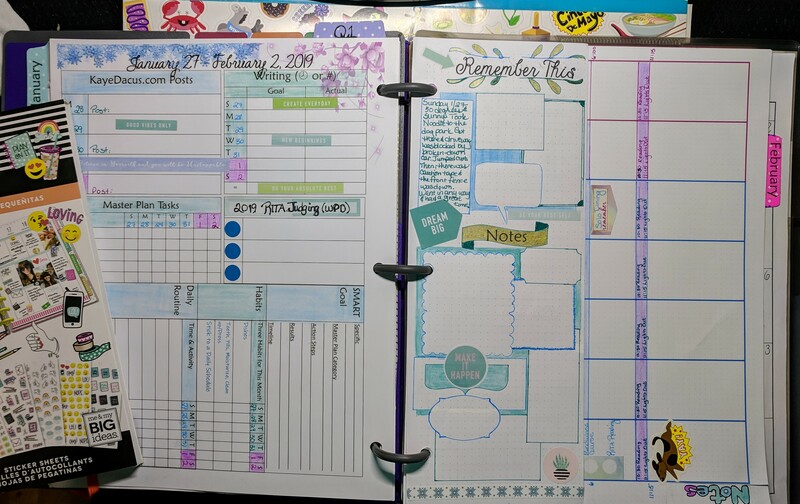 I discovered in the design process that having the weekly spread set up in a separate file works better for me—it’s easier to go in and make the date and art and color changes in this file rather than in the one that has all of the quarter, month-at-a-glance calendar, and monthly planning spreads for the whole year. Now, because I only print out the weekly spreads a month or so in advance, in case I decide I want to make changes to a layout or box for that month, I’m only printing eight to ten pages at a time—but I do have all of the quarterly and monthly pages already printed and in the notebook to help with future planning. Once I’m happy with the way the week-at-a-glance looks, I save it as an image and then insert that into the main Planner document—that’s the file where all the rest of the planner pages live—it makes it easier to turn it into the landscape orientation without messing up the layout of any of the elements. I then do this for each week of the month and print them all out at the same time. In another separate file, I have my dutch-door notes and to-do list. Because it’s half a page, I can print two weeks on one sheet of paper, so I don’t usually print more than that, since there’s no point in having those just lying around loose. Then it’s time to get planning! Before I start, I make sure I have all the supplies I need—the correct colored gel pens (here I’m using PaperMate InkJoy in Pink, Light Blue, and Aqua, some store-brand colored pencils in Mediterranean teal, bubbly blue, and—not pictured—berry; and a Pilot Precise V5RT fine-point black gel ink pen—along with a pencil. I have several different sticker books I’ve picked up in various places—from Amazon to Target to JoAnn. And I’m ready to get started. The first part of the process is adding a little color to the module headers as well as adding in the dates. I use the colored pencils to color the headers, as anything else just makes a mess of the ink-jet toner. My food blog, LowCarbKaye.com, is on hold until at least March. So, I used some stickers to repurpose that three-day block for a priority project I do have going on right now. Then, I used some stickers in the modules for my main blog, KayeDacus.com, where I’m only posting three days a week right now, as well as for my writing schedule, which is also on hold for the time being. Then it’s time to decorate my Notes half-page. I outline the text boxes in pen, then colored in around them with pencil. I also included some banners from the stencils as well as some stickers, just to make it fun. Oh, and I added a metallic gold gel ink pen to this, too. On the back of that dutch-door is my to-do list for the week. I start by going back to last week’s list to see what I didn’t get done and needs to be moved forward to this week. I also look at my month-at-a-glance calendar and add anything important from there, as well as any additional Post-it notes I’ve written to myself. I make sure to leave room for more to-dos as the week goes on. Since my Quarter 1 goal is sticking to a structured daily schedule for the work-day part of the day, that part of my week-at-a-glance is pretty easy to fill out. Here’s where I do bring in the coded colors—such as blue for work and orange for breaks or personal tasks or errands. Sunday is a much less structured day, but with multiple tasks that need to at least be started if not completed, so it gets its own to-do list. And that’s it. There’s a lot more I need to fill in, but since a lot of that is of a personal nature—or it’s things like blog post ideas that I haven’t figured out yet—I won’t bore you with all those details. Remember, if you like this content and would enjoy seeing more videos like this, please click that thumbs-up and hit the subscribe button—and don’t forget to ring the bell to make sure you get updates whenever I upload a new video. Now that I’ve covered the overview of my Master Plan for 2019, I want to get into the actual planning part of my planner. In this YouTube video, I walk through planning a quarter and a month (the script I worked from is pasted below the video). Hey, all, and welcome back to my YouTube channel. Today I want to talk about quarterly and monthly planning. Because I worked in a corporate environment for the first decade-and-a-half of my adult life, I got very accustomed to the year being broken down into not just months, but also quarters. And there’s something about being able to plan something that needs to happen within the next three months rather than the next four weeks that makes it feel more attainable. Plus, sometimes there are things that we need two or three months for—like building and breaking habits. So after my Master Plan spreads, I get to my Quarter 1 planning spread. There are a few things that I know will have to be done each quarter, so I went ahead and put those in on the computer before printing the pages—car maintenance and housekeeping. Yes, there’s a daily housekeeping list, too, but these are the big things, the tasks that only need to be done between one and four times per year rather than every month or every week or every day. Same thing with the car maintenance. And just for kicks, I added a quarterly car loan tracker. It’ll be paid off in July, so it’ll be really exciting to see that number dwindle for Quarter 2 and Quarter 3! The other two boxes on this page are more for brainstorming/brain dumping. Some of the Things to Do and See are ideas of things I’d like to do, and some are must-dos. And, of course, there’s no way I can afford to eat at all the restaurants listed here in the next two months (since we’re already near the end of January and I haven’t eaten out once yet this month). Again, it’s more of a wish list than a to-do list. The big piece for quarterly planning is my SMART goal for the quarter (I’ll link to my class on goal setting in the description box below). This is something that ties in with my master plan focus areas and something that can be completed in a three-month span of time. This first quarter, it’s getting myself onto a structured schedule for the work day. More than just “my work hours are 9 to 6, but actually following a plan for blocks of productivity time with scheduled breaks—with a plan for what to do during those scheduled breaks. And in addition to tying it back to several Master Plan categories, I’ve also written out specific action steps for myself to keep it top of mind as I go through the quarter planning my months and weeks—including a weekly review and evaluation of what worked and what didn’t, how I did with the schedule, and making revisions if necessary. All of this with specific results in mind—the main ones being the schedule becoming a habit, my work and overall productivity levels increasing, and my body clock resetting to the specific sleep and wake times. At the end of each month, I sit down at the computer and pull up the events calendar from the local newspaper as well as the Events section of Facebook and look for activities coming up to do the upcoming month. Because I moved to this city only a little more than a year ago, I’m still trying to plug in to the community. And I enjoy knowing what kinds of events and presentations the local museums, historic sites and society, and theater are doing that I might be interested in going to. All of that gets put on this monthly calendar. The last week of the previous month, I also sit down and start filling in my monthly plan spread. For January, because I got really excited (and had a lot of time over Christmas break), I used my blank graph box for a whole bunch of Master Plan ideas for the month—more than I actually have been able to keep up with. From my Master Plan, I narrow down three habits to build and three milestones—with rewards. Habits are things that I need to be doing daily and need to continue doing once this month ends. Milestones can be things that I can do all month—such as giving up fast food (except coffee shops, of course! )—or specific things I need to get accomplished that month, such as finding a local chiropractor and eye doctor, which I’d been putting off since I moved here. And each milestone comes with a reward, from something small, like buying stickers and decoration for the planner, eating out, or buying a ticket to a production at the theater that I want to see—making the reward commensurate with the milestone. Then the rest of the spread is going back and looking at my Master Plan and coming up with specific tasks to do during the month. A lot of my Master Plan areas are things that I know I’ll be doing each month, so that’s why they’re printed instead of blank boxes. The only thing that I didn’t do on this page for January was the recap of the previous month, and that’s because I’d stopped using last year’s planner long before December. So I’ll do that at the beginning of February for the first time, since I’ve been using this all month. Oh, and you may have noticed that I have a color theme for the month. I decided that instead of color-coding each category, which was making me crazy having to either look up the colors or memorize them, I’d go with a color scheme that matched the borders I dropped into the calendar pages before printing. Since my January snowflake border is in shades of blue and aqua, I decided to use those colors. And I really like the way that it’s turned out—which you’ll see more of in another video. Because that’s how I plan my quarter and month. Next time, I’ll show not only how I plan my week, but how I designed the pages, if I can get the screencast to work! If you like this content and would like to see more videos like this, please like and subscribe. If you have any questions about my planner or my process (or anything else! ), please let me know in the comments! See ya next time. I’ve mentioned, and shown photos from, my 2019 life planner—a “not-a-bullet-journal” planner that’s based off of some of the ideas that I’ve gleaned from the professional BuJo-ers out there (I’ll link to a few below). One of the most important spreads that I incorporated into the planner this year is a Master Plan spread. In this YouTube video, I walk through the Master Plan pages and explain how I’m using them (transcript—well, the script I worked from—is pasted below the video). Hi, all, and welcome back to my YouTube channel! Today, I’d love to do a quick run-through of the Master Plan section of my planner. In 2018, I started out the year with “Goals” – and you know that when I talk about goals, I mean being specific, setting measurable, actionable steps with specific results on a pre-determined timeline. And you also know how that can be both motivating and debilitating once those timeline dates come and go without the anticipated results because the steps haven’t been taken. This year, in studying several professional bullet-journalers’ blogs and videos, one thing that several of them suggested (I’ll provide a few links in the description box below) creating a Master Plan—and breaking it down into categories—or life areas—that I really want to concentrate on this year. Before I even sat down at the computer to start creating my 2019 planner, I started listing the focus areas for me this year. I came up with . . .
After I’d created/printed the pages, I realized that I needed space for Crafts and Spiritual. So I added what bullet-journalers call a “dutch door”—a half-page that gives more space without completely covering up the pages on either side. I used colored paper simply because I had it in my notebook already. And, yes, many of these categories overlap. Pretty much everything in here (except professional) falls under “personal.” Self-Improvement, volunteering, spiritual, activity/exercise, housekeeping, etc., all cross-pollinate with each other. So it looks like there are a whole lot more things to focus on than are really here—because so many things go onto multiple lists. But it’s nice to be able to explore them from a different angle of focus, and to be able to tie some of them together that I might not have thought of as being complementary before. Then, even with using colored ink, because black type and black grid lines on white paper still isn’t all that interesting, I decorated with different shaped bullets and washi tape to try to match, or at least coordinate, with the color scheme. I also put washi tape down the bottom 2/3 of each Master Plan page to make this section easier to find when I’m working on planning. And you can probably tell that this isn’t regular, flimsy 20-pound copy paper. I use at least 28-pound bright white, and prefer 32-pound, in order to stop the printer toner and pen ink from ghosting through to the other side. How am I using this? Well, I’m referring to it quite often, actually. Not only when doing my quarterly and monthly plans, but I’ve also added a weekly tracker in which I can add an activity from one of five chosen categories that I want to do that week. That means that each week, I’m reviewing these and thinking about what I can be doing in order to incorporate these focus areas into my life. And there you have it. That’s my master plan for using the Master Plan section of my life planner in 2019. If you have any questions, please let me know in the comments. If you like this video and would like to see more content like this, please click through to the video on YouTube, like, and subscribe. See you next time! In previous years, I’ve challenged myself by increasing the number of books I read year-over-year. This year, because I’m planning to take some kind of online course each month or so (I just started a course on Mindfulness on Coursera this week, in fact) as well as get back into teaching online—here on the blog, on YouTube, or on SkillShare—I need to be wise about my time and what I’m doing with it. Considering that we’re finishing out the third week of the year and I’ve finished one book and am about halfway through another, I’m pretty much on track to average about one finished reading per week. Now, because I don’t limit this to full-length (50k+ words) books, reading at least one title per week is doable, as some of those will be short stories, novellas, and (possibly) long-form blog-post series. Yes, you’re seeing that right—I built in a fifteen-minute “just one more page” buffer at the end of the reading time. 🙂 As with everything else I’m doing until it all becomes habit, I’m setting a timer, just to make sure I don’t stay up too late if I get caught up in the story. And just about the only thing I’m going to make myself stick to on this page is to re-read my own published and unpublished writing as a way of recapturing my storytelling joy. But that’s part of another goal that I’ll write about in another post! What’s your reading goal(s)/challenge(s) for 2019? If you’ve set a goal on GoodReads, please share the link to your challenge in the comments! Wow, I’m way behind on getting my 2018 recaps posted. My only excuse is that I’ve been so busy planning for 2019 (see here and here for more info on that process). My first goal was to read 60 titles (books, short stories, long-form blog, etc.). My second goal was an A-to-Z author challenge—two authors for each letter. I planned to challenge myself throughout the year—from one writing/craft book per quarter to at least four critical reading to reading books from a list of categories/genres. I had a major reading slump the second half of the year, so I really had to push myself to get sixty titles in. But I just managed to do it at the literal eleventh hour. Since I got so far behind on the overall numbers toward the end of the year, I stopped worrying about the authors’ last names and just read. That’s the only way I was able to at least meet one of my challenges. How did you do on your 2018 reading challenge? Yes, it’s that time of year—time for resolutions and goal setting; time to rehash last year and set new goals and challenges for this year. And it’s also time for me to jump on the “word of the year” bandwagon and choose a word that will be my theme/focus for 2019. My word—my theme—for 2019 is RELEASE. I know that sounds weird—but as someone who hasn’t written in more than five years because of the stress and trauma caused by my last writing contract/book, there’s a lot that needs to be released before I can regain the joy I once took in writing: release the anxiety, release the stress, release the expectation that I have to do anything with my stories other than write them for myself. There are a lot of other areas of my life in which release is needed . . . but those are a little too personal to get into online! Do you have a word/theme for this year?